Lindsay here again. Sorry to hog the blog from Whit but I just gotta tell you about spring in Korea. Are you picturing spring? Cherry blossoms and cotton-candy colored dogwood blooms, blue skies, occasional spring showers, warmer weather, clean, fresh air? As beautiful as a day Saturday was for our Gwangju half marathon was as ugly and yellow of a day as it was on Su nday. I walked out mid-afternoon after sleeping late and a nice creamed-eggs-on-toast brunch to what looked like Armageddon. I was scared. No one was out. Which might sound normal for Bakewell, Tennessee. But not Korea. Never. Not even those crazy arm-swinging women with face masks and hot pink jogging suits. I started worrying that the buses weren’t running, which would definitely be a first. Everything was gray. And yellow. Not foggy gray, mind you. But scary Armageddon gray with some-kind-a-scary yellow particles in the air. My bus eventually came and I looked around at the brave few to see if these were in fact going to be my last moments on earth. I sure would hate Armageddon to come on a bus with ten Koreans and their bad breath mixing with the lingering smells of dried fish and diesel and scary yellow particles. I was on my way to book club, too. Wouldn’t that be ironic to spend my last moments on Earth on my way to talk about “My Best Year Yet! !” God. He’s such a jokester. But no worries. I am still alive. All my goal-setting for the coming year was not in vain. I was informed by my friend Catie and later Whit that the scary yellow dust particles that seemed to be closing in on my throat and settling into my skin was sand from the Gobi Desert mixed with a little good ol’ fashioned Chinese factory pollution. After reading about this first round of yellow sands to hit Korea this spring in today’s newspapers, I see that this happens throughout the normally flowery season. 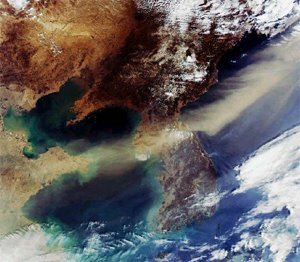 The sand storms have been growing in frequency and toxicity over the years because of China’s rapid economic growth and has added to increased tensions with neighbours South Korea and Japan over recent years. The dust picks up heavy metals and carcinogens such as dioxin as it passes over Chinese industrial regions, before hitting North and South Korea and Japan, meteorologists say. Dry weather and seasonal winds in China hurl millions of tonnes of sand at the Korean peninsula and Japan from late February through April or May, turning the skies to a jaundiced hue. 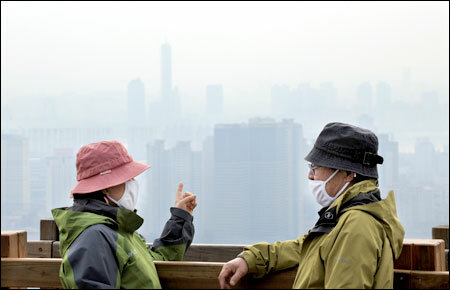 The state-sponsored Korea Environment Institute said the dust kills up to 165 South Koreans a year, mostly the elderly or those with respiratory ailments, and makes as many as 1.8 million ill.
How terrible! I wonder what will happen as China increases its industry. I think you should invest in some of those masks the Koreans were wearing! Girl! You had better go buy a mask, cover your whole body with clothing and take a shower as soon as you get home! Why do you think everyone was indoors? You will be glowing by the time you get back to the states. At least you won’t have to worry about getting hit at night while you are jogging. You will have a nice glow and be very visible!!!! That sounds really gross. I mean, we have yellow air sometimes, but it’s just pollen from all the pretty flowers and trees! Seriously, I’m obsessed with you two. Love your blog as always and am SO proud of your new PR, Linds. I’ve gotta get faster! 🙂 Gave you some love on my blog today. Miss you still. I’m glad you think God is a joker too. I told one of my co-workers the other day that God likes a good laugh every now and then too. They looked at me like I was crazy.